Neurodevelopmental disorders (NDDs) can affect how the brain grows and develops. Some examples of NDDs are attention deficit hyperactivity disorder (ADHD), obsessive compulsive disorder (OCD) or autism spectrum disorder (ASD). Children who have different NDDs may act in a similar way and share the same genes. Changes to the way different brain areas are connected to each other could also be shared across children with different NDDs. 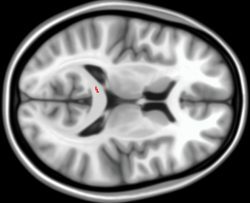 This study looks at how connections in the brain may be similar or different in children with ADHD, OCD and ASD. This information can help scientists understand how changes in the brain may be linked to NDDs, which may help in creating better treatments. Magnetic Resonance Imaging (MRI) is a type of technology that is used to take pictures of the brain. In this study, 200 children had a MRI of their brain taken. Two thirds of those children had ADHD, OCD or ASD. The other children did not have a NDD. Questionnaires were used to learn more about attention, social and independent living skills and obsessive-compulsive symptoms in all of these children. The MRI images showed that there are differences in the connections that help different parts of the brain talk to one another. For children with ADHD, OCD and ASD the connections in their brain are not as organized (Figure 1). This connection organization related to a child’s independent living skills. More organized connections were generally in children with greater independence skills and less organized connections were generally in children with less independence skills. Figure 1: The connections between sides of the brain showed differences in participants with ADHD, OCD and ASD compared to controls. This difference was seen in the area shown in red. Children with NDDs develop connections between areas in their brain differently. This affects how the different areas of the brain talk to one another. These changes are common in children with ADHD, OCD and ASD, and are something that is shared among children with NDDs. Changes to brain connections are linked to children’s independent living skills. This suggests that treatments focusing on these changes in the brain could improve a child’s independent living skills and be used for children with ADHD, OCD and ASD. The full research article was written by Stephanie H. Ameis and colleagues, and was published in the American Journal of Psychiatry in December 2016.